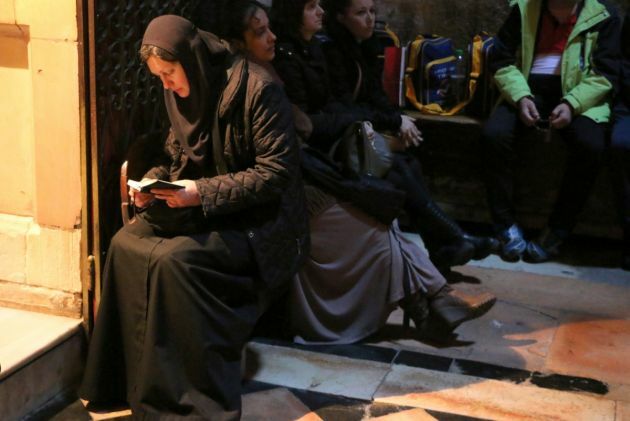 (Photo: © Peter Kenny / Ecumenical News)A woman prays on Feb. 10, 2016 in the Church of the Holy Sepulcher, the church in Jerusalem where Christians believe Jesus was buried and resurrected after his crucifixion. Jerusalem church leaders have kept the doors of the Church of the Holy Sepulchre closed for a second day in a tax standoff with the city's municipality and in protest of a proposed land expropriation law that will affect the Christian community. Three church leaders had the door locked and issued a joint statement, accusing Jerusalem's mayor, Nir Barkat, of violating the status quo in moves that they said seemed like an attempt to "weaken the Christian presence in Jerusalem." The legislation was initiated by a member of Israel's Knesset member Rachel Azaria, would expropriate the ownership of lands sold by churches to private buyers, The Jerusalem Post reported. The church is one of Christianity's most noted place of worhsip and Sunday closed its doors until further notice as church leaders angrily retaliated against what they see as a "systematic campaign" by Israel to harm the Christian community in the Holy Land. The church leaders said the Israeli authorities move was a "systematic campaign of abuse against churches and Christians." Franciscan Custos of the Holy Land Francesco Patton and Armenian Patriarch Nourhan Manougian flanked Greek Orthodox Patriarch Theophilus lll read out a statement and then locked the ancient doors of the church in Jerusalem's Old City. "We will decide when and how the church will re-open," he said, likening Israeli policies to anti-Semitic laws enacted against Jews in Europe, the Times of Israel reported. The church in Jerusalem's Old City is viewed by Christians as the site where Jesus was crucified, buried and resurrected, so it for many Chrisitans viewed as the holiest site. It was last closed briefly around 20 years ago to protest against Israeli policies. The immediate trigger was the churches' discovery that the Knesset's Constitution, Law and Justice Committee was to discuss — and probably pass — a bill on allowing the State to confiscate land sold by the churches to private investors since 2010 and pay the new owners compensation, The Times of Israel reported. The Patriarch said, "We, the heads of churches in charge of the Holy Sepulchre and the status quo governing the various Christian holy sites in Jerusalem... are following with great concern the systematic campaign against the churches and the Christian community in the Holy Land, in flagrant violation of the existing status quo. "Recently, this systematic and offensive campaign has reached an unprecedented level as the Jerusalem Municipality [has] issued scandalous collection notices and orders of seizure of Church assets, properties and bank accounts for alleged debts of punitive municipal taxes. "These actions breach existing agreements and international obligations which guarantee the rights and the privileges of the churches, in what seems an attempt to weaken the Christian presence in Jerusalem. The greatest victims in this are those impoverished families who will go without food and housing, as well as the children who will be unable to attend school."